Charter Everything welcomes you with the topnotch transportation facilities serving all over New Jersey. 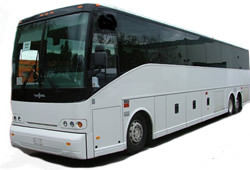 We take pride to provide convenient and highly economical charter bus options for you so that you and your group can enjoy a NJ Bus Charters without worrying about anything. Charter Everything offers you the most comprehensive charter services which are highly affordable for any group travel. If you are planning to visit New Jersey whether for your business purpose or personal charter with your family and friends, we offer convenient booking option for any group. With local offices in Central New Jersey our NJ Bus Charters is always available for any pickups in NJ. All our drivers and chauffeurs are completely trained and know the best travel routes, local DOT rules and restrictions; they will remain very friendly to you and your group and take you to your desired place in the safest way possible. Our comprehensive charter services is available to all groups so why not enjoy your journey with only the best. At Charter Everything our NJ Bus Charters services offers the complete travel package that you will need for any group traveling. We provide our charter services for School Trips, Corporate Shuttles, Church Events, Bachelor Party, Wedding Bus Rentals, Family Trips, Theme Park Trips, Proms, Private Parties, Airport Transfers and Tour Bus Shuttle Services. You can visit our service page anytime and can view information about our NJ bus services that provide to our valuable clients. Our high quality bus services have been used by millions of groups throughout the USA and our clients highly appreciated all the hard work and dedication to our services. Look no further our NJ Bus Charters services is the best option for any group, we will be very happy to serve you with our credible, reliable and convenient bus transportation service.